I think its pretty obvious that I love Origins. Practically all my skincare is from their brand and everything I've used from them I've really liked. When the press release for the new Origins A Perfect World BB Cream hit my inbox I knew I had to inquire about trying it out. I've recently been getting into lower coverage foundations, as my skin has improved a lot in recent months. I've also given up dairy I really don't need full coverage anymore so most of my foundations are pretty obsolete. 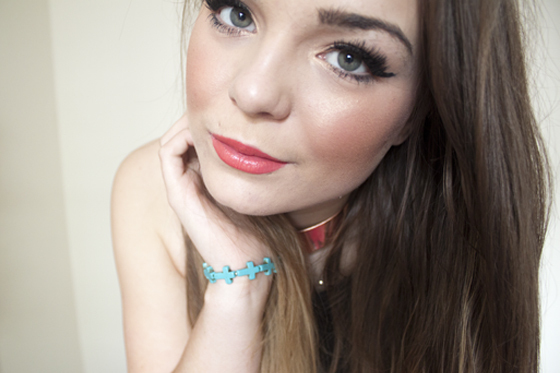 Like most beauty bloggers Im always on the search for a new foundation so I thought no harm in trying a new one! 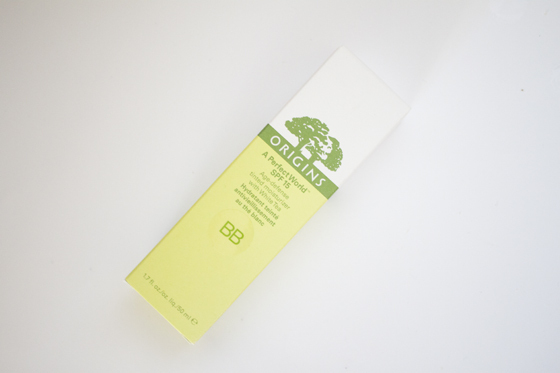 The Origins BB Cream contains White tea, which is supposed to help boost the skins natural defences and fight off the damaging effects of pollution. 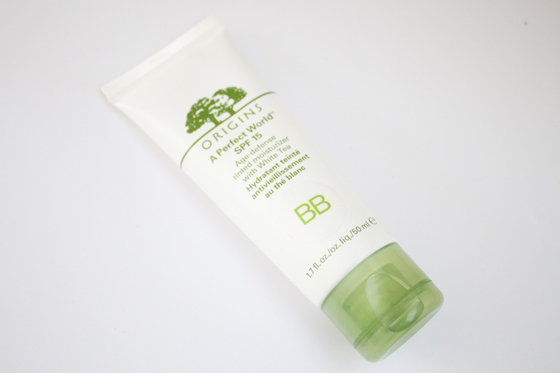 Origins describe this as both a BB Cream and a tinted moisturiser which is sort of confusing as they are either one or the other. I don't think it's a "true" BB Cream as the coverage is on par with a tinted moisturiser, but is very build able. The consistency is thicker than a tinted moisturiser but not as thick as a foundation. I use about a pea sized ammount and buff it onto my face with my Real Techniques Buffer Brush. I was impressed by the coverage, its very light but its perfect for evening out skin tones and sorting out any redness. You can also build up areas when you use a brush to apply. I still use concealer with this product as it doesn't completely hide the blemishes or under eye circles. I have the lightest shade which is Light, which I think is an OK match, Im not pale pale either so you may struggle finding a good match if your paler than me. It does come in 6 different shades which is pretty rare for a BB Cream. I wore this BB cream as a foundation during that hot spell we had a few weeks ago as I wanted something lighter on the skin and found it worked well. It has SPF15 in as well which was a huge bonus. Compared to other BB creams I've used I really enjoyed wearing this one, It's very light and doesn't feel like it's sitting on my skin. It really sinks into my face. Despite this being a massive difference from the foundations I normally wear I have been reaching for it a lot and opting for a light base and then concealing the areas I need more coverage. I then add a powder like my MAC Mineralize Skin Finish Natural to add a touch more coverage and give a matte finish. As you can see by my demo photo, when I wear it light this it gives a nice soft base but still some of my flaws (see my chin scarring) comes through. I think it is expensive for a BB cream as most are a lot cheaper. However it does have a lot of skincare benefits built into it which might justify the higher price tag.